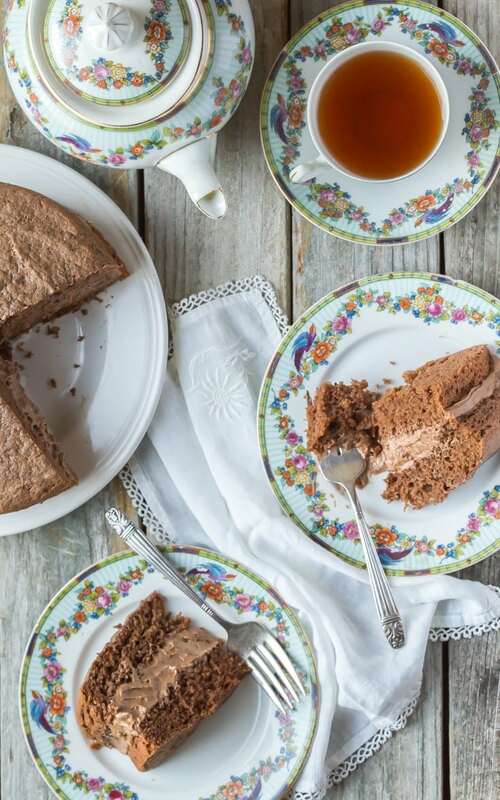 The BEST Gluten Free Chocolate Cake! Rich, fluffy and can be made dairy free, an easy one bowl cake, a perfect gluten free birthday cake, or for any occasion! 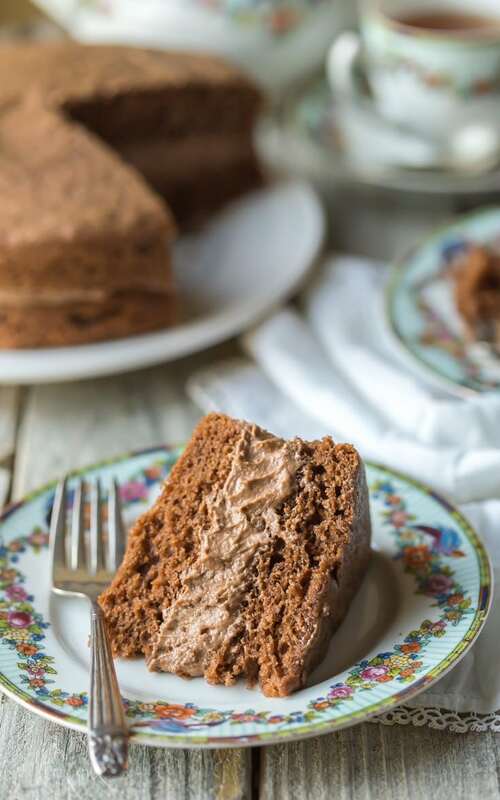 I’ve been making this gluten free chocolate cake since I switched to a gluten free diet, I think it was one of the first gluten free baking recipes I tried out and it’s unbelievably easy, even if you are new to gluten free! The first step is to find a quality all purpose gluten free flour blend, they are not all the same and some will work better than others. I prefer to create my own (linked above) but if you don’t want to do that then buy a decent ready made blend that does not already have Xanthan Gum added to it, it’s better if you can measure and add your own gum. I recommend that for this cake recipe (and all gluten free baking recipes) you use a digital kitchen scale. I do have cup measures in the recipe, but I’ll explain why baking by weight is more consistent. One cup of your gluten free flour blend may not weigh the same, cup for cup, as my homemade blend or another commercial ready made blend. All the commercially available blends have different mixes and ratios of flour in them. I’ve weighed cups of different blends of flour and noted that a cup of gluten free flour can vary in weight from 125g up to as much as 170g depending on how you scoop it, and what type of mix you use. You can see how this could drastically alter the outcome of a recipe! I have assumed an average of about 125g-130g per cup of all purpose gluten free flour, but again that’s just approximate and will vary depending on your flour. This is such a simple recipe I promise, so all you need to do is assemble the cake mix ingredients as they are listed and add them to the bowl of your stand mixer if you have one and mix until blended, it’s easy peasy! Whether you are using a stand mixer, or a bowl and hand held mixer I always like to make sure that I scrape down the sides of the bowl, and carefully scrape up from the bottom of the bowl to ensure it’s fully mixed. Now it’s just a matter of carefully dividing the cake batter between two cake pans and baking until they are ready! 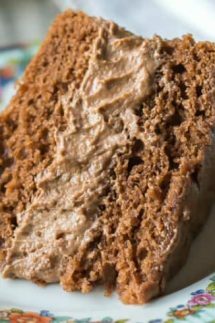 I like to make the frosting while the cake is cooking, but do make sure the cake is fully cooled before you add the frosting or it will melt in a hurry! As I mentioned above, I prefer to use my own All Purpose Gluten Free Flour blend to bake this cake, but I’ve made it in the past with all kinds of different flour blends and it’s worked well with all of them. If you don’t want to make your own flour blend then I recommend a decent ready made blend without gum added. Better Batter gluten free flour and King Arthur Multipurpose Gluten Free flour are both popular options that should work well for this recipe. I use Bob’s Red Mill Xanthan Gum for my gluten free baking recipes, I trust the brand and although it’s an expensive outlay initially for such a little bag it does last a long time and I extend the shelf life by keeping the open bag in a ziplock in my freezer. In theory you could mix this all by hand in a large bowl and with a wooden spoon, but that will take a lot of elbow grease! I love my Kitchen Aid Mixer but you can definitely make this just as easily with a large bowl and hand held mixer. You’ll also need some parchment paper to line your two 8 inch round cake pans, I prefer the type with pop up bottoms rather than springform. More Easy Gluten Free Baking Recipes! If you’re looking for more gluten free baking recipes to try then don’t leave without checking out some more of my favorites!! 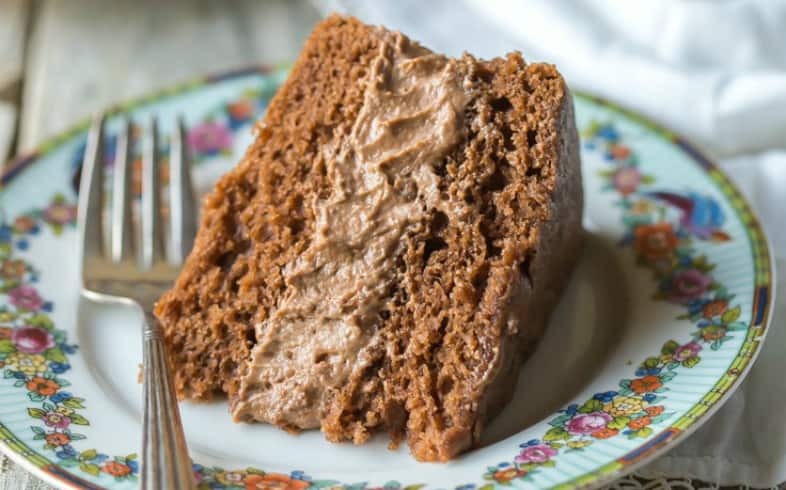 If you’re looking for another delicious gluten free cake recipe be sure to check out this Gluten Free Vanilla Cake from Gluten Free on a Shoestring, it looks lovely! It was the very first recipe I adapted from an old church cookbook to make it gluten free so I’ve been making it for years. It is very forgiving and should work well with most gluten free flour blends, though some will produce better results than others. Don’t miss my favorite crispy gluten free chocolate chip cookies, I love them! Oh – if you want gluten free chocolate cupcakes I’ve got a recipe for that too! BEST Gluten Free Chocolate Cake! Rich, fluffy and can be made dairy free, an easy one bowl cake, a perfect gluten free birthday cake, or for any occasion! Put all the cake ingredients in the bowl of your mixer and mix well until combined. Add in a 2 - 6 tablespoons soy milk to get a mixture that is a little thinner (but not runny) so that it drops off the side of the spoon when you tap it on the bowl. Evenly divide the mixture between the two pans and smooth out with an offset spatula, then bake in the oven near the top for 25 - 30 minutes or until cooked. When they are cooked let them cool on a rack. When they are fully cooled you need to sandwich the two cakes together the chocolate filling. Add in the sieved powdered sugar, margarine and sieved cocoa to the mixing bowl and mix well to combine. Taste it and add more cocoa powder if you want a stronger chocolate flavor. Add in a little milk if you need to, to make the frosting softer. I recognise that most Americans are used to the cup method which is why I also include those measurements,but they may not give you accurate results. If you are a keen gluten free baker I would encourage you to invest in a scale,you can get one for only $10 - $15. 2.I prefer to use my own homemade All Purpose gluten free flour blend as it's cheaper and I get really great results. This cake looks mouthwateringly delicious! Nice photography too, beautiful compositions! What a perfect cake. It looks so fluffy, light and delicious whilst still being rich enough in chocolate flavour! This cakes looks killer, Sheena! Gluten free to boot? I think I know which cake I’ll be making for my friend’s birthday this year (she’s on a gf diet)! Thank you for a great recipe! Thanks Christina, I hope your friend loves it! You can use butter if she is not dairy free. I’m going to make this got a co-workers birthday. Can I use regular butter in the cake or does it need to be dairy free?